A copper alloy possible horse harness ring of Bronze Age to Roman date (c. 1000 BC - AD 410). The ring measures 15.34mm in diameter (internal diameter 9.21mm), is 3.18mm thick and weighs 1.43g. It is circular in shape with a defined circumferential ridge running around the centre. The interior surface also features a defined circumferential ridge, creating a lozenge-shaped cross section. The interior surface exhibits scratch or wear marks which appear to have occured during use. The ring has a smooth dark green patina. 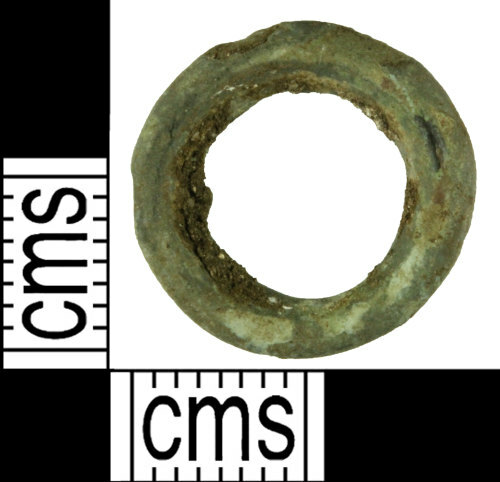 Similar rings have been discovered in a number of Bronze Age hoards and have been suggested as horse harness fittings, as being part of the handles of a sheet-metal cauldron of Class A1 (Type Tul-na-cross) and Class B1 (Types Llyn Fawr, Ballyshannon and Castlederg) (Gerloff 2010, Pl. 17, 7b; Pl.32, 14a; Pl. 33, 14f-h; Pl. 34, 15d, Pl. 54, 33c and Pl. 66, 37g)., or part of a chain from which a cauldron or other vessel was suspended over a fire. Cf. WILT-9439A7 for a similar example on the database.